Hair, Nails & Skin has worked for countless others, so why not let it work for you. With just a few short weeks of regular use you will begin to see improvements, and you can start living your life with confidence! Ingredients: Vitamin A (beta-carotene), Vitamin C (ascorbic acid), Vitamin E (d-Alpha tocopheryl), Vitamin B-1 (thiamine), Vitamin B-2 (riboflavin), Niacinamide, Vitamin B-6 (pyridoxine hcl), Folic Acid, Biotin, Pantothenic Acid (calcium panto.) Calcium (carbonate), Zinc (oxide), Copper (gluconate), Choline (bitartrate), Silica (bamboo 70% extract), Inositol (monophosphate), para-aminobenzoic acid, L-Cysteine, MSM (methylsulfonylmethane), Ginko Biloba (24% extract), Saw Palmetto (5:1 extract), Pygeum Africanum (5:1 extract), Green Tea (98% extract), Grape Seed (95% extract). 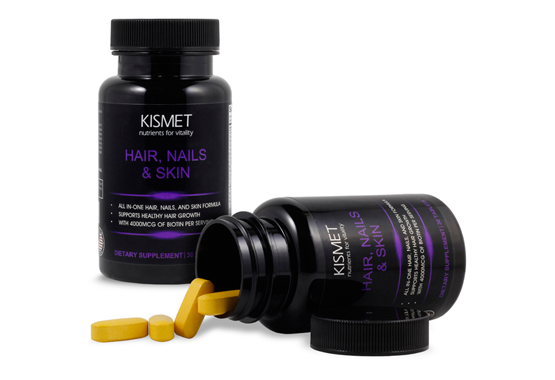 Watch our product video on KISMET Hair, Nails & Skin and learn more about our natural supplement that provides your body with essential vitamins, minerals, and additional nutrients on a daily basis to help you maintain strong and healthy beauty and skin . Our unique formula is designed to work in a synergistic way to help support your hair, nails and skin. People experience changes in hair growth, such as thinning or excessive hair loss, for a number of reasons, including alopecia, estrogen and testosterone imbalances, and even hereditary hormones. Hair transplantation surgery can even cause shock loss, which may lead to significantly less hair growth than expected after the procedure. 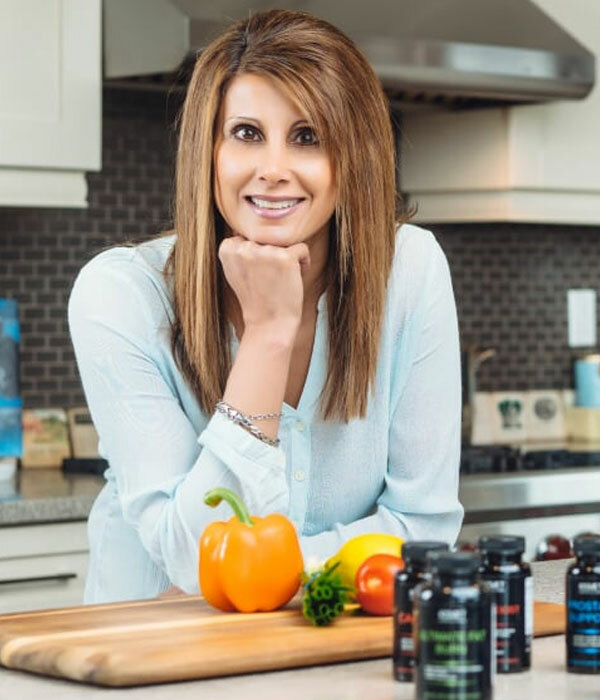 If you want to simply reduce hair shedding or prevent extensive hair loss from continuing, it may be time to add a potent supplement to your diet. Although a well-balanced diet helps support the health of your hair, taking an additional supplement, such as Hair, Nails & Skin, helps you are getting the right amount of nutrients needed to boost hair growth. How Can a Dietary Supplement Support Hair Growth? The optimal hair growth supplement should be able to specifically target the processes that are causing your hair loss. For instance, alopecia is a condition in which inflammation of the skin causes the formation of scar tissue that prevents new hair follicles from growing. Many people who suffer from alopecia also develop bald patches because of the scar tissue. This means that the hair supplement you choose should be able to promote the healing of any scars that may be preventing new hairs from growing. Another reason that hair loss typically occurs in men and women is due to the conversion of testosterone into a substance called dihydrotestosterone (DHT). As DHT levels begin to increase in the body, the strength and length of hair decreases. Therefore, the supplement you take should be able to target DHT as well. By taking a dietary supplement like Hair, Nails & Skin promotes the healing of tissue in the scalp as well as the optimal balance of hormones and nutrients, you will experience long-term hair growth. A beneficial hair growth supplement should contain a combination of essential vitamins such as A, C, E, biotin, folic acid, and a vitamin B complex. Vitamin A supports the growth and repair of cells in hair follicles and the skin, including the scalp, thereby decreasing the chances that scar tissue will disrupt hair growth. Potent antioxidants that boost your body’s production of collagen are also supplied by vitamins C and E. Collagen strengthens hair follicles, maintains elasticity in the skin, and also promotes strong nails. Taking B vitamins regularly also helps ensure that your body has the right amount of nutrients it needs to promote the growth of strong, long hair. B vitamins are so potent that they help reduce the occurrence of excessive dandruff, eczema, and dermatitis, all of which are conditions that can damage the scalp and prevent your hair from growing. Therefore, it is important to look for a hair growth supplement that contains B vitamins such as thiamine (B1), riboflavin (B2), niacinamide (B3), and pyridoxine (B6). Additional vitamins and minerals such as Pantothenic acid, Ginkgo Biloba, Grape seed, Calcium, Zinc, Choline, and Copper improve blood circulation in your scalp. This process stimulates the growth of new hair follicles and strengthens existing follicles by ensuring that they receive an adequate supply of oxygen and nutrients. Methyl-Sulfonyl-Methane (MSM) and the amino acid L-cysteine, help maintain the proper balance of collagen as well as hormones that support hair growth. It is also important to be sure that the supplement contains Green tea, Saw Palmetto, Inositol, and Para-amino benzoic acid as each of these help target alopecia as well as DHT, which is a substance that is linked to hair loss. Overall, taking the right combination of vitamins, amino acids, and minerals can promote long, healthy hair as well as vibrant skin and nails. If your hair is thinning or you have started to notice significant hair loss, you should take Hair, Nails & Skin, a dietary supplement that contains all of the scientifically based ingredients that not only support enhanced hair growth, but also improve the health of the skin and nails. If you want to prevent your hair from becoming thin and brittle, or feel uncomfortable about losing significant amounts of your hair, consider taking Hair, Nails & Skin. The ingredients in this dietary supplement are backed by scientific research which demonstrates their ability to prevent hair loss and rejuvenate hair follicles. If you’re ready to experience a thick, full head of luxurious hair try Hair, Nails & Skin today. By simply taking 2 tablets daily with meals, you too can achieve a level of confidence that you never thought possible! QUESTIONS? COMMENTS? I WOULD LOVE TO HEAR FROM YOU!